There are many ways people can help to fight against the abortion holocaust. Many individuals feel that because they are not politicians, or public leaders, that they cannot make a big enough impact to save babies lives. In fact, this is far from the truth! Every single person who fights against abortion does have an impact. The saying, “it takes a village to raise a child” is the same with the pro-life movement… every single person counts! So maybe you are not a politician, but that doesn’t matter. You can still act to help end abortion. Here are some ways that you can help make a difference on the political level. Being an informed citizen is important. Before you vote or support any political leader, whether it is at the local, state, or federal level, make sure the candidate is pro-life. As many people know, numerous politicians will say anything in order to get a vote. So make sure that the political candidate that you want to support is 100% pro-life, that their platform and beliefs are pro-life, and that the politician would be willing to stand by the pro-life position. What is a true pro-life politician? Well, there are some important things to look for. What is their track record? If there is a political candidate who has already held a political position, it is important to look at their past. Do they have a history of speaking up for the unborn? If not, then consider a different candidate. Because, if their past did not include the pro-life position, why would it be any different the next time? During election season, a great way to help support a pro-life candidate is by volunteering your time. Get in touch with the local campaign managers and groups, to see what you can do to help support their campaign. Let other people know that the candidate you support stands up for life. Continue to keep up with the abortion issue and stay up-to-date and informed with what is going on. The abortion issue constantly comes up at the local, state, and national levels, even when it is not an election year. Talk to those in office, and let them know that you are another person who won’t stand up for the killing! 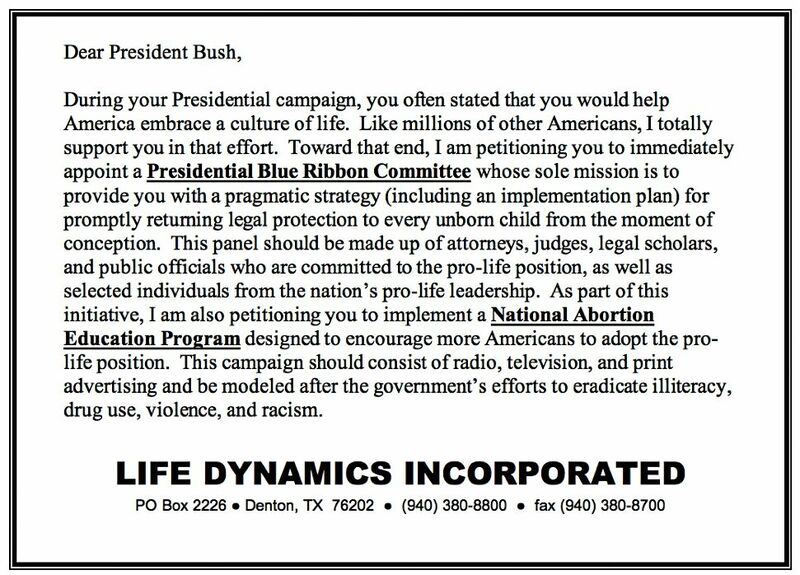 Also, sending politicians copies of Life Dynamics’ reports that expose the abortion industry’s true colors can have a huge impact on political efforts in your area! Be sure to support petitions and any lawful measures that come up that could help to end the killing. A good example of a petition is one done by Life Dynamics, called The First Step Petition. The following petition was delivered to the White House the morning of February 12, 2000, and featured 131,627 signatures. However, the most important thing to do is to never give up! Even though federal laws may not currently be on our side, the pro-life movement is winning. Remember to keep up the good fight because winning is how the killing stops!